Just a day after being drafted by the Dallas Mavericks, I connected with Ray Spalding’s camp and was set to chat with him over the phone on Friday morning. After missing his initial call, I noticed I had a voicemail upon arriving to the American Airlines Center. And it was the voicemail that immediately impressed me. It was one of the most polite, respectful voicemails I have ever received. And after speaking with him on the phone for a short period of time, it was clear that the well-mannered Spalding kid out of Louisville was excited for his shot in Dallas. Just over 12 hours before our conversation, Ray Spalding was drafted by the Dallas Mavericks with the 56th overall pick in the 2018 NBA Draft. Spalding grew up in Louisville, Kentucky, where he spent the early part of his childhood playing every sport that was offered. As his height became his most definable asset, basketball quickly took center stage in his life. In middle school, the 6-foot-4 Spalding would dunk for the first time. As he went into his freshman year at Trinity High School, Spalding would shoot up to 6-foot-7 and begin to make his transition into becoming a big man. As he continued to turn heads in high school, Spalding took another leap in his game heading into his senior season at Trinity High School. Then it was a full-on recruitment battle from some of the top schools in the country. Spalding would have offers from Duke, Indiana, Xavier, Clemson, Butler and other big-time programs across the country. The most important one of all? Undoubtedly the University of Louisville, which was less than 10 miles down the road from his high school. When the dust settled, Spalding wanted to play for the school he grew up dreaming about and a school that would allow him to stay close to his family. And family means the world to Spalding. 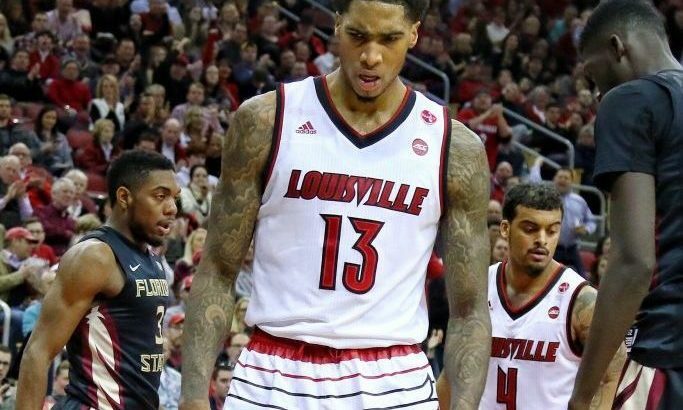 Spalding would head into Louisville as a freshman for the 2015-16 season. Although he would spend his first two seasons coming off the bench, he used that time to build on his game and form relationships that would last a lifetime, one of those being Utah Jazz guard Donovan Mitchell. It was Spalding’s junior year at Louisville that would garner the attention of people in NBA circles. Spalding earned 10 more minutes a game, started in 34 games and would be the second-leading scorer for the Cardinals and team leader in rebounds by a wide margin. He shot 54 percent from the field, was second on the team in blocks and even led the team in steals, with 54 on the season. Although Spalding loved his time at Louisville, he did acknowledge that it wasn’t the easiest road there with everything that happened with the program during his stay there. But after his stellar junior season, it was decision time for Spalding as he would test the NBA waters and attend the NBA Draft Combine. He would measure at 6-foot, 10.35 inches tall with a 9-foot-1 standing reach. What turned some heads was his impressive 7-foot, 4.75-inch wingspan, a top-five longest wingspan at the 2018 combine. He also came in at 215 pounds, but this is an area that Spalding is focusing on as his camp says he is at 226 pounds now and looking to be around 230 pounds heading into training camp this fall. After the combine, Spalding would obviously hire an agent and keep his name in the draft. And with the 56th pick, he would become a Dallas Maverick. “I’m glad they gave me an opportunity,” an ecstatic Spalding told me. He also said he has been to Dallas one time: to work out for the Mavericks before the draft. So what kind of player is Ray Spalding? “He has a chance to improve his overall game as one can’t teach his quick jumps,” that same member of the front office added. Spalding can throw down the nastiest of dunks and block shots way above the rim, but something he has been working on this summer is his jump shot. If Spalding can prove that his jump shot is a consistent and reliable threat, he could prove to be one of the steals of the draft in the second round. With him spending time in his earlier years on the wing, Spalding has some ball-handling skills that get hidden at times due to him playing down low. “I like to face up on slower guys because I am quick for my height,” Spalding said. When handling the ball on the break, he isn’t your typical 6-foot-10 big either. The comparison game is popular among fans and media, especially leading up to the draft. But Spalding doesn’t like to compare himself to anyone. There is only one Ray Spalding. But even though he doesn’t like comparisons, he does like to pick parts of other player’s games that are already in the league. Spalding isn’t comparing his game to either of these players, but simply trying to take particular skills from fluid athletes similar to his frame. The question is why did he drop to the bottom of the second round? Was it because he was a late bloomer during his three years at Louisville? Maybe because he only attempted 19 3-pointers last year or because of his skinnier frame in college? No matter your answer to the question, Spalding is ready for his opportunity.